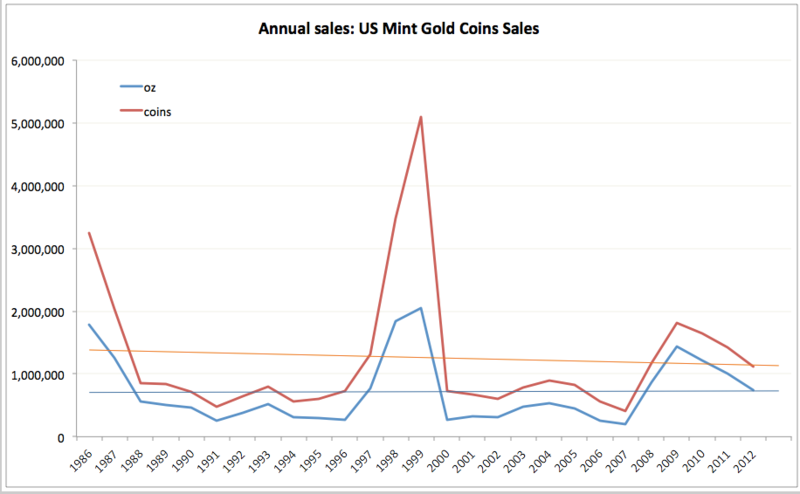 The readers of this blog would be familiar with the exclusive time series on US Mint sales of Gold coins that I have maintained for some years now. With December 2012 sales finalised, it is time to update the annual and monthly data analysis on these. Here is the analysis for January 2012 – to open the year – that predicted ‘return to fundamentals’ theme for coin sales. And here is my article for Globe & Mail on what fundamentals relate to gold coins sales. I am happy to note that my prediction of moderating trend in speculative buying and restoration of stronger link to long-term behavioural demand and savings fundamentals has been confirmed through 2012. In 2012 the US Mint sold 747,500 oz of gold in form of coins, down 25.25% y/y, with demand for coinage gold declining below 2008 levels of 860,500, but well-ahead of the 2005-2009 average annual sales of 640,800 oz per annum. In terms of longer-term averages, 1990-1994 average was at 384,050 oz, 1995-1999 average at 1,047,800 oz, 2000-2004 average run at 386,550 oz, 2005-2009 average at 640,800 oz per annum and 2010-2012 average is currently at 989,333 oz per annum. 2012 was the 10th highest demand year in history in terms of volume of gold coins sold in oz of gold, with series covering 1986-2012 period. In other words, 2012 was not a good year for Gold Bears and for Gold Speculators alike. This doesn’t make it a great year for Gold Bulls, but, given that the average annual gold price in 2012 stood at $1,678/oz – ahead of any on the record and up 7.0% on 2011 – it does appear to have been another year when fundamentals seemed to triumph over shorter-term psychosis. My annual forecast for sales in 2012 was 694,050, which means that simple dynamic trend of moderating sales expectations based on previous years’ price effects was bearish. US Mint sold 1,123,500 coins in total in 2012, down 21.27% on 2011. 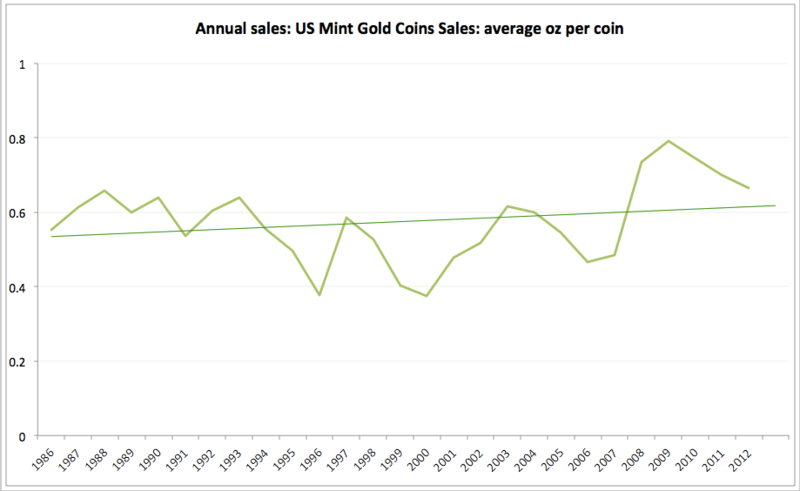 The demand for actual coins was at the levels compatible with 2008 when the Mint sold 1,172,000 coins and well ahead of all annual sales in 2000-2007 period. In terms of longer-term averages, 1990-1994 average was at 637,620 coins, 1995-1999 average at 2,246,300 coins, 2000-2004 average run at 738,700 coins, 2005-2009 average at 955,800 coins per annum and 2010-2012 average is currently at 1,397,167 coins per annum. In other terms, current sales are annually bang on at the annual average for the last 8 years. 2012 ranks as the 10th most successful year for coins sales in terms of the number of coins sold, confirming my view in the third bullet point above regarding sales of coinage gold in oz. My forecast for 2012 sales was at 1,21,223 coins – a much closer call than on oz of gold sold via coinage, suggesting that the demand remains closely driven by long-term dynamics. In terms of both – sales in coins numbers (1,123,500 coins) and oz (747,500 oz), 2012 results stand in close comparative to the historical averages. Historical average (1986-2012) for coins sold is 1,261,170 and for oz of gold sold through US Mint coins is at 717,343 oz. 2012 average coin sold by the US Mint contained 0.665 oz of gold per coin, down slightly on 0.701 oz/coin in 2011 and well-ahead of the historical average of 0.574 oz/coin. 2012 ranks as the fifth highest year on record in terms of average oz/coin sales. There is, so far, no overshooting of the trend to the downside – something that could have been expected if demand for gold coins was showing speculative bubble deflation dynamics or post-bubble correction, although, of course, we cannot say with 100% accuracy that this is not going to materialize with some lag. There is no acceleration in the convergence trend in 2012 or since convergence began in 2009. This episode of convergence is shallower (in terms of annual speed to target) than in 1997-2002 period and 1986-1991 period. The above, of course, implies that given moderating price increases in gold (+7% for annual monthly average in 2012 compared to 22.21% rise in 2011, 25.61% in 2010, 11.44% in 2009 and so on), we can expect a slowdown in overall oz and coins volume demand, which can lag price changes. This is exactly what appears to have taken place in 2012. As before, I remain comfortable with the 2012 trend and am looking forward toward more stabilised demand dynamics in 2013, with volume of sales declining in 2013 to ca 500,000 marker in oz terms and 850,000 in coins numbers terms, assuming no major volatility in gold price and in line with continued stabilisation in the world economy.